The first of the Epsom ‘Plan E’ improvements is starting on Monday 9th January 2017 and is due to finish at the end of March 2017. 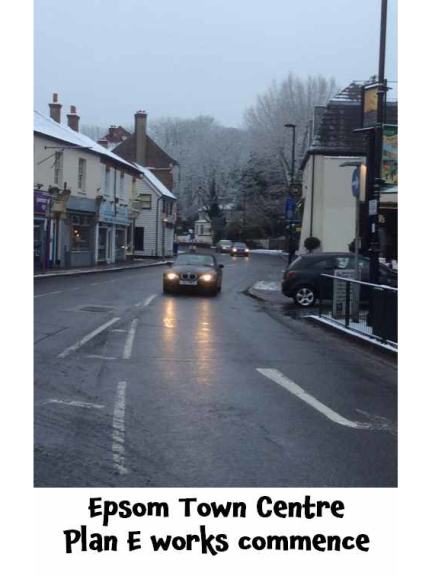 If you’re travelling through or to Epsom during this time allow extra time for your journey. The first work will be on Ashley Avenue. This is to build a new bus stand which will replace the existing one on the High Street. The current bus stop on Ashley Road, by the Methodist Church, will remain operational during the work as will the other bus stops in the town centre. The majority of this work will be carried out Mondays to Fridays, with lane closures operating between 09.30 and 16.00 in Ashley Road and Ashley Avenue. If necessary some work might take place on Saturdays or at night to make sure the project is finished as quickly as possible. Please refer to the Phase A -Traffic Management Plan which illustrates the road layout. The impact of the work will be monitored during its first few days and adjustments made to nearby traffic lights if necessary. Access to properties and businesses will be maintained at all times. Our construction team on site will advise if there are any access issues. The footpath from the Ashley Centre to House of Fraser will remain open to pedestrians. The Ashley Centre Car Park will also be open throughout the work but between 09.30 and 16.00 it may take longer than usual to get into the car park, so drivers are advised to consider using other town centre car parks. We apologise in advance for any inconvenience you may experience as a result of these essential works.